Embark on a trip through time, a two-hundred-year, multi-generational journey starting from the western strip of Russia, the Pale of Settlement, and making several stops across Europe at the major Jewish-populated cities of Kalush and Lodz before crossing the Atlantic Ocean. This moving biography and well-researched family saga begins with Paul Weinberg’s ancestors in the 1790s. Two families from the town of Kalush, Ukraine, are united when a young man moves to New York and brings his first cousin to the new country to be his wife. 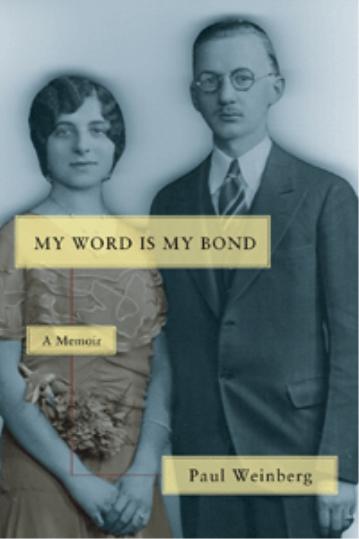 My Word Is My Bond follows the families of Paul’s parents, David and Dorothy, as they make their home in America. It is also their love story, which unfolds like a richly embroidered tapestry. Life wasn’t easy for Dorothy, the second daughter of immigrant parents, or David, the third child of poor, uneducated parents who had lived under the rule of the czar. David, who rose from a temporary employee at the Bank for Savings to being appointed vice president, faced peer hatred because he was a Jew, yet he conquered the barrier of discrimination. This personal memoir pays tribute to one family’s history and their perseverance to overcome widespread anti-Semitism.